A memoir of the twentieth-century art world, from the famed Art Institute of Chicago curator, critic, and historian. Katharine Kuh made it her personal mission to bring modern art to the people of America. In 1935, in the midst of the Great Depression, she opened Chicago’s first commercial avant-garde art gallery, exhibiting Paul Klee, Marc Chagall, Ansel Adams, Alexander Calder, and Joan Miró. She went on to serve as the Art Institute of Chicago’s first curator of modern painting and sculpture. Her long career also took her to New York, where she was an art critic for the Saturday Review. Kuh traveled extensively, developing close friendships with many of the artists she championed and admired, including Mark Rothko, Edward Hopper, Ludwig Mies van der Rohe, and Fernand Léger. 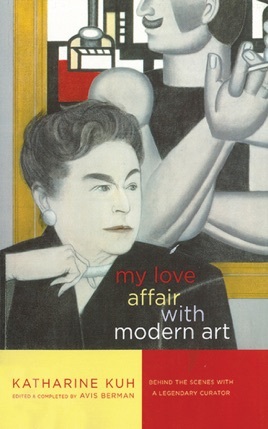 In this “scintillating collection of incisive essays,” Kuh takes you on a personal tour of the art world she loved. With her keen wit and insight, she shares personal remembrances of the artists she knew, from their personal lives to their creative influences and working methods. Kuh also elaborates on what inspired her most, the difference between looking and seeing, and the adventurous thrill of curatorial sleuthing (Chicago Tribune). Also included is a preface by Kuh’s close friend, art historian Avis Berman, sharing details of Kuh’s personal life that make her story even more compelling.